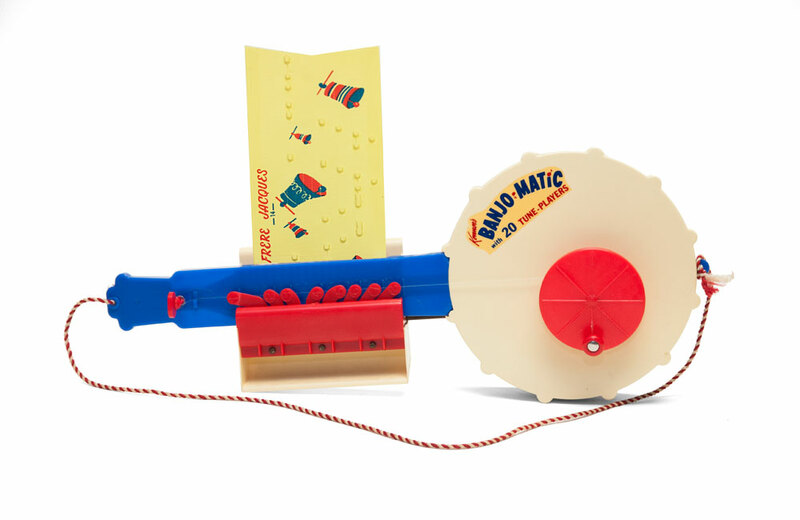 In 1962, Kenner released a toy musical instrument called the Banjo-Matic. According to ads from the time, the toy allowed a child to “play real banjo music.” And by “play”, Kenner meant that a child could enjoy the Banjo-Matic’s ability to self-play a variety of canned musical numbers. The ability to experience the joy of automated banjo picking was facilitated through the use of one of 20 plastic “tune-players” that were included in the package. A tune-player is fed into a slot at the top of the Banjo-Matic and moves through the toy when the player turns a handle. As the tune player is read, keys are automatically depressed and notes are generated. Some of the songs provided with the Banjo-Matic included the following knee-stomping classics: O Susannah, Clementine, Camptown Races, Red River Valley, Home on the Range, Workin’ on the Railroad, and my personal favorite, She’ll be Comin’ Round the Mountain. If automated music isn’t your thing, the Banjo-Matic will also allow you to channel your inner Earl Scruggs or Alison Brown and generate your own notes and songs by plucking the toy’s single nylon string. Buoyed by the success of its View-Master, GAF released an audio-enabled variant of the 3D stereoscopic picture viewer in 1969-70. Clancy the Great is of the more peculiar entries in the annals of Ideal Toy Company's product lines.